BERLIN — Germany coach Joachim Loew is brimming with confidence just over three weeks before what he calls the country's "golden generation" begins its World Cup defence against Mexico. Germany is one of the favourites in Russia despite the retirements of Philipp Lahm, Bastian Schweinsteiger and Miroslav Klose since winning the tournament in Brazil four years ago. Players like Toni Kroos, Sami Khedira, Mats Hummels and Thomas Mueller have grown into leading figures with the side, which wrapped up qualification with 10 wins from 10 games and 43 goals, a record number of goals for a European team in qualifying. "I don't have to coax new craving or new enthusiasm from the players," Loew said in comments reported by news agency dpa. "The craving and ambition are still there, even among those who became world champions." Germany's only worries concern the fitness of captain Manuel Neuer, defender Jerome Boateng and midfielder Mesut Ozil. Neuer hasn't played since September with a hairline fracture in his left foot after being injured in training. Boateng is still recovering from a thigh injury sustained in the Champions League semifinals. Ozil missed Arsenal's last few games of the season with back problems. Team doctor Hans-Wilhelm Mueller-Wohlfahrt gave Ozil the green light to start training with the team and he was to decide Friday if Boateng should stay in Munich for further treatment or join the squad. "We don't want to make any mistakes," Loew said of Boateng. "I think he'll be able to at least take part in some team training next week." Neuer, too, is being given every chance to prove his fitness. Loew named four goalkeepers in his 27-man preliminary squad and is hoping that the 32-year-old Neuer won't be the one sent home before FIFA's June 4 deadline for final squads to be submitted. "He can tolerate all the strains, even the most strenuous strains like jumping," Loew said. "If he has the feeling he can perform at 100 per cent he can be at the World Cup." Barcelona's Marc-Andre ter Stegen will keep the No. 1 spot if Neuer doesn't recover fully. Ter Stegen was to join the rest of the squad on Friday, along with Bayern's Hummels, Mueller, Joshua Kimmich and Niklas Suele, as well as Chelsea defender Antonio Ruediger. "It's clear to everyone that the training camp is to get the required strength and power for the tournament. 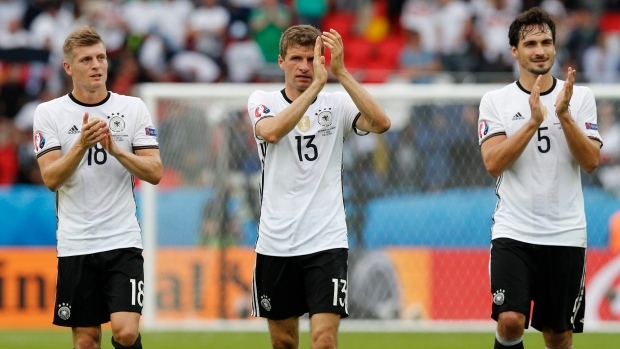 The fuel has to be there," said Loew, who also hopes it boosts team spirit. "Everyone has to know that he is just a puzzle piece for success. Nobody can be world champion on their own." Loew recently signed a contract extension through the next World Cup in Qatar in 2022. The 58-year-old former assistant coach took over after the 2006 World Cup and has led Germany to the semifinal stage or further in every major tournament since. Germany has two warmup matches, against Austria in Klagenfurt on June 2 and Saudi Arabia six days later in Leverkusen, to iron out any pre-tournament issues.